The Place If you have not been to the new revamped wing of Marina Square, you might be missing out on the new F&B scene. The latest to open just few days ago is Kai Garden, a Cantonese restaurant helmed by Owner and Executive Chef Fung Chi Keung, previously the Group Executive Chef of Paradise Group and Xin Yue. The spacious 200-seater restaurant comprises three main sections: Dim Sum, Roasts and the Main Kitchen. The Food With Chef Fung previous credentials, expect some of his previous classic dishes such as Signature Crispy Peking Duck, Garoupa in Lobster Soup, Kung Fu Matsutake Soup, and Sweet and Sour Pork on The Rocks. Our starters are nothing ordinary like the usual cold dishes at Cantonese restaurants. The Chilled Cherry Foie Gras ($24 per serving) was a surprise hit for me. I would expect some delicate skills here to stuff the foie gras into the cherries, which turned out to be a refreshing combination literally, surprisingly. What’s a Cantonese meal without a good bowl of soup? I had the Braised Whole “Ya Jian” Shark’s Fin in Supreme Collagen Stock ($34.80/per person), with the Shark’s Cartilage forming the core of the stock which is slow cooked for 6-hours. The broth was rich with Collagen, the kind of soup which I can have forever. I love Peking Duck, so the highlight of the meal for me was Chef Fung’s Signature Crispy Peking Duck ($88/whole). Chef Fung is no stranger to the use of beautiful natural colours to visually entice diners (remember the famous colourful Xiao Long Baos from Taste Paradise? 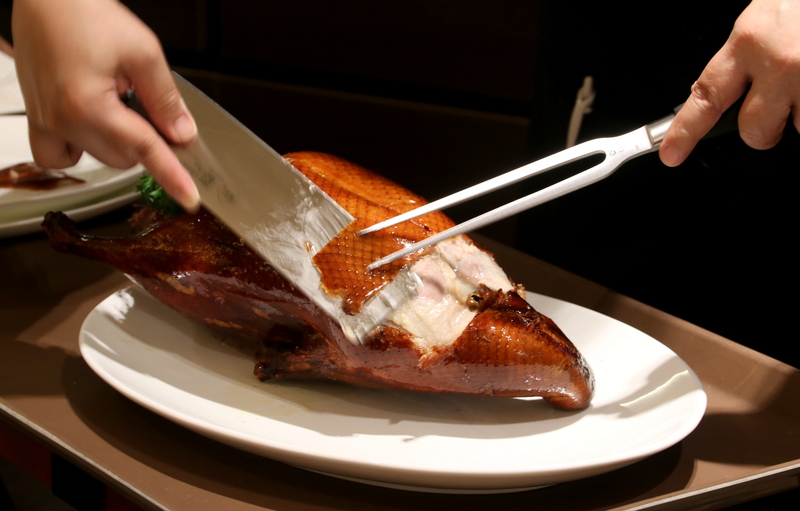 ), as evident from the Peking Duck served. Talk about creative juices flowing, but the 5 unique wraps and 5 dipping sauces left an impression on me. Choose from the basket of Original, Pumpkin, Green(Spinach) , Bamboo Charcoal, and Beetroot wraps, to go with the Duck, Black Pepper, Sesame, Seafood, or Special Mixed sauces. The Garoupa in Lobster Soup (Seasonal price) was another of my favourite of the night. The luscious lobster essence could only be made from fresh ingredients, so you get the idea. It reminded me a little of the Chinese version of Lobster Bisque, less the cream. Kai Garden does not go by convention, judging from the presentation of the Sweet and Sour Pork on The Rocks ($22 per serving). I was skeptical of serving the classic sweet and sour pork on ice, but the pork turned out to be very tender and delicious. If you love fried items, go for the Deep Fried Vegetarian Roll ($22 regular portion), which was packed with mixed vegetables and mushroom with tofu encased in a crisp net of bamboo fungus. Sinful but you won’t regret having it. Using squid ink, the Pan Fried Charcoal Pork Bun ($6.80/3 pieces) is a deviation from the traditional bun. The skin was crisp and I like how juicy the meat fillings were. Just a caution to beware while biting into the bun as the juice might squirt all over, like mine. To end off the meal, we had the Chilled Fresh Coconut Puree ($6.80 per person) made from fresh coconut, a refreshing end to the meal. Rants The dishes have generally surprised me, in a good way. It’s a festive month, I shall rant less. Will I Return Again? Kai Garden is a mid-range Cantonese restaurant which I believe will appeal to the crowd. The standards are high and given Chef Fung’s track record, I know I need to return to try the Dim Sum. Make your reservation instantly at Kai Garden here.